To a cop, a RADAR locator is considered a "speeder's tool", much the way lockpicks are considered burglar's tools. That is another reason why it is so important for the fast and safe driver to make sure his/her RADAR locator installation is stealthy. I believe I have come up with the best possible compromise between concealment and performance. For starters, I use a recent vintage Valentine 1 RADAR Locator. (A RADAR Locator detects RADAR, but a RADAR detector does not locate RADAR. Detecting without locating becomes more counterproductive the more sensitive the detector is.) Also, my car makes it possible to install the necessary components such that they are very usable and not very noticeable. My V1 is above the rearview mirror, where its high view maximizes the reception of RADAR signals. It is behind the dark tinted band at the top of the windshield, which minimizes noticeability. My dark nonmetallic car is not a very good LIDAR target, but even if it was, I think I'd still prefer having my V1 safe from prying eyes than to give it a better view of pulses of light. The windshield contains no metal or metallic film, so RADAR reception is not attenuated. This mounting, however, necessitated lowering the rearview mirror slightly to make room for the V1's thickness. The optional V1 concealed display fits very nicely across two switch openings in the dashboard. Since my car only had one available opening, I relocated the sunroof switch to the empty switch opening in the console, just ahead of the power window switches, where its use is more convenient and intuitive anyway. 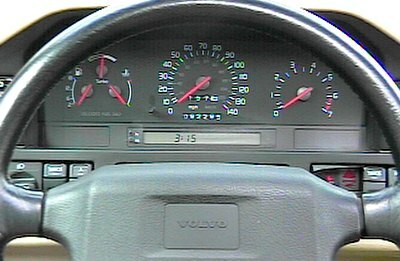 The display, which shows me signal strength, signal type, signal direction, and number of signals, is placed just inboard of the steering column. Raising the steering column causes it to be even harder to see from the side window. 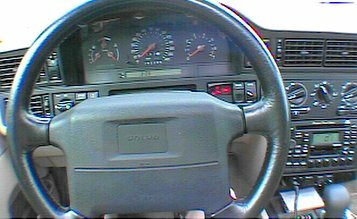 It is blocked from the driver's view whenever the steering wheel is turned to the left, however. This made for a pretty nice installation. 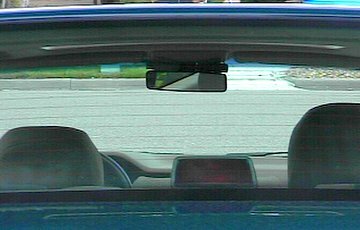 However, the V1 is above the passenger side of the rearview mirror, which meant reaching across the mirror in order to hit the mute button, not a very stealthy behavior. While complaining to Mike Valentine about the way the original V1 kept unmuting around strip malls with lots of door openers, necessitating repeated reaches for the mute button, he mentioned the V1's built-in capability for a remote mute switch! So my built-in mute button now resides in the end of the wipers stalk, where it can be pushed without my having to take my hand from the wheel. The 1999 (and '98) V1s can be user programmed with user preferences. So now my V1 shuts the hell up when I hit the mute button, and stays silent until after all RADAR signals are gone, without having to turn the "muted volume" control (outer ring around volume control knob) all the way down. This way, the unit retains its 2-stage audible warnings and also has silent muting. Unfortunately, Valentine has not quite fully implemented this programmability, so I do not have the option of hearing a soft bogey-lock tone (dee-deet) when a new signal source is acquired during this silent period. However, having the concealed display within my line of sight by the instrument cluster mitigates this minor oversight. The only other feature one could possibly need is to be able to turn off the V1 without reaching for it, in the event one has the opportunity to speak with a law enforcement officer up close and personal. 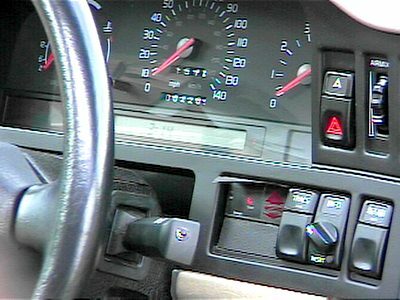 An extra SPST factory switch on the left side of the steering column can do the trick without calling any attention to itself or its use. Needless to say, no wires are dangling down the middle of the car from the V1. 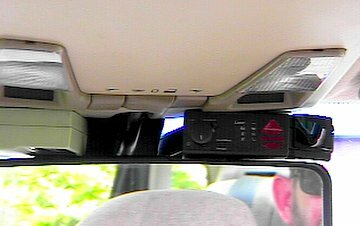 And the concealed display has a little black paper hood to prevent reflections from being visible in the windshield to any to leeches -- or others -- from behind. Even if one knows what to look for, it's difficult to notice from outside the car.